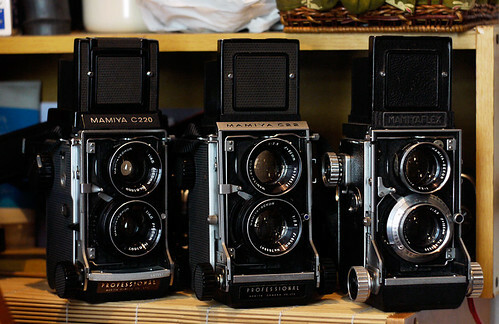 The Mamiya C series is a professional-level series of twin lens reflex medium format cameras made in Japan. It was the third series of TLR cameras made by the company. Mamiya began to produce 6x6 twin lens reflex cameras from the late 1940s the first, now very rare, was a conventional design. In the early 1950's A and B series TLR cameras were also based on fixed lens designs. This was quickly followed by the C series which began in 1956 starting with the Mamiyaflex C. It broke away from the traditional TLR designs used by many different manufacturers. One notable distinction of the C series is the fact that they can use interchangeable lenses—a feature only found on one other TLR camera, the Koni-Omegaflex. It was possible to use interchangeable lenses. A double extension bellows system of focusing permitted very close focus. 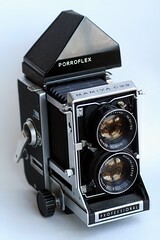 Similar to the previous Mamiyaflex A and B models, it features a automatic film advance, so it does not require the use of backing paper markings on the film for exposure counting. The advance is in the form of a lockable knob on the right hand side of the body. The film compartment is a bit different compared to many other TLR cameras. The film path is straight without a 90 degree bend. Like most TLR's the film is on the bottom spool and the take up reel is on the top spool. Loading the film require aligning the start indicator on the film to the body. 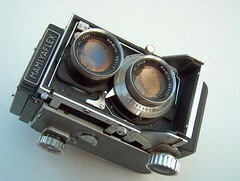 The Mamiyaflex C2 was released in 1958, it was improved by having the focus knobs on both sides of the camera. The base of the camera has been redesigned with a longer flatter base eliminating the need for lengthy front feet. 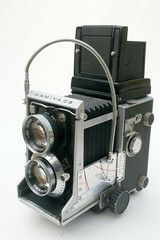 The Mamiya C3 was the third development of the C released in 1962. The C3 was the version that became popular with amateur and professional photographers and was the foundation for the success of the following models. It improves upon the C2 by having a winding crank instead of the knob design. 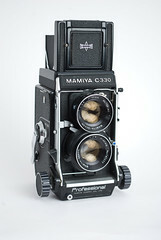 The Mamiya C33 is an improved version of the C3 released in 1965. The most notable improvement is parallax compensation. There are marking on the left of the ground glass with an indicator needle. Areas above the indicator are cut off. 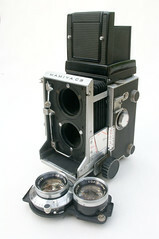 The Mamiya C22 was released in 1966. It originally had 120 film compatibility, but 220 film was introduced a year before, so this model has removable back plate. 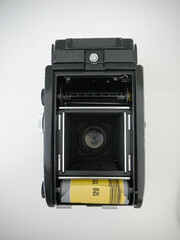 This was primarily designed for the single exposure sheet film back, but Mamiya decided to release a 220 capable model. 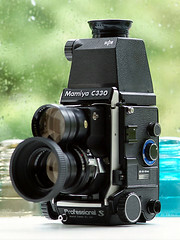 The Mamiya C330 was released in 1969 as an improved version of the C33. A new feature is interchangeable focusing screens and fully supports both 120 and 220 film. Revised versions was released in 1972 as the C330f and the final version C330S was released in 1983. 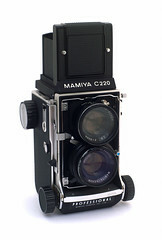 The Mamiya C220 was released in 1968 and replaced the C22. This model supports 120 and 220 film. A revised version was released in 1982 as the C220f. The first lenses are the chrome lenses that feature the Seikosha-MX shutter. These lenses have a shutter speed range from 1 to 1/400 of a sec. These have steps of 1, 1/2, 1/5, 1/10, 1/25, 1/50, 1/100, 1/200, and 1/400. The second series of lenses use the Seikosha-S shutters. These lenses have a shutter speed range from 1 to 1/500 of a sec. A third black series of lenses was released with shutters marked Seiko-SLV or Seiko. Each set of interchangeable lenses had its own shutter and iris diaphragm, this was not an entirely new concept but it was the first time it had been used on a TLR camera. The shutters used were leaf shutters with slow speeds and X and M sync. 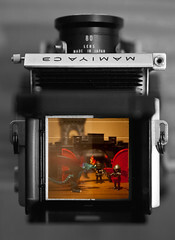 The system gave the professional photographer a couple of significant advantages over the conventional TLR. The same camera could now be used for wedding groups with a wide lens and for formal studio portraits with a long focus optic. A further consideration was, that the most vulnerable component in any camera is the shutter, if a shutter went down on the Mamiya the lens could simply be changed. Mamiya devised a system to allow the lens unit to be changed on a loaded camera. Turn the knob on the side of the camera to “ unlock” this would raise a flap behind the shutter to prevent light reaching the film plane, put a red marker in the viewfinder to indicate the light path was now obstructed, and release a lock on the lens retainer. Hence it was not possible to remove a lens unless the shutter aperture was blanked off. The second problem with close focus on the Mamiya was the question of parallax error brought about by the vertical separation of the viewing and picture taking lenses. This error could be quite severe at close distances. 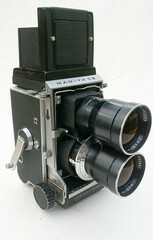 Mamiya provided a solution with a device called a Paramender, it fitted between the camera and the tripod. The photographer focused and composed the picture on the screen as usual, then activated the Paramender. Which simply moved the camera upwards by an amount equal to the distance between the viewing and taking lenses, so that the taking lens now was in the position that was occupied by the viewing lens. All lenses generally work in any body, but there may be some incompatibilities. Automatic cocking cameras (C33, C330) may not be fully compatible with the original Seikosha-MX series lenses as the lens cocking arm is in a different location. Older bodies with newer lenses could differ depending on which compensation scales are on the camera. This may render focus, parallax, and exposure incorrect for these lenses. Mamiya extended the cameras versatility even further with a range of accessories including various focusing attachments and a sheet film back. The resulting design was more cumbersome than the usual TLR but was considerably more versatile, and quickly found favour with serious amateurs and professionals. Diopter +2.5, +2, +1.5, +1, +0.5, -0.5, -1, -1.5, -2. This page was last edited on 21 March 2019, at 01:24.